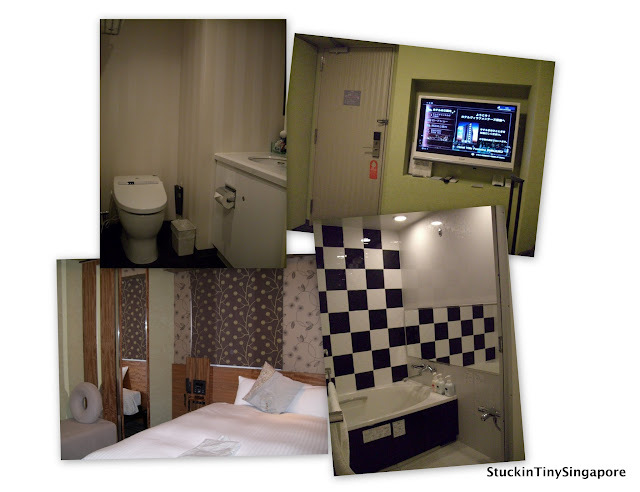 Having been to Japan quite a few times, I thought I will write a post on the type of accommodation I have stayed in especially in Tokyo. There are plenty of choices ranging from budget to $$$, from the normal to the wacky. Unfortunately, it's not in our comfort zone to try out the wacky ones. So what I have here are the normal from reasonable budget-conscious type to comfy 5 stars hotel. Nowadays with the advent of the internet, nobody can give the excuse that they cannot find a place to stay while on holiday. There are tons of booking sites, review sites, the list is endless. I remember the time when internet was new (ohhh, Am I revealing how old I am?). Anyway, back on point, back in the days, going on holiday, especially free and easy was more challenging. I love the INTERNET! The first time we went to Tokyo was back in 2007. We found a great place to stay in Tokyo. The place we stayed was called the Tokyu Stay, an apartment hotel. They have 15 hotels scattered around Tokyo, from Ginza to Ikebukuro to Shibuya. The advantages of such a hotel is that their rooms have kitchenette sand they even provide free internet. The current rates for a standard room in Tokyu Stay in Higashi-Ginza ranges from JPY 9,400 to JPY 17900 (SGD$145 - 278) a night. We stayed at their Higashi Ginza branch. It was a brilliant location just right next to the Tsukiji Market and the Higashi Ginza Tokyo Metro Stop. Our room had two twin beds, there was a computer which had free internet and doubled as a TV. There was also a little kitchenette with a washing machine, fridge and a electric stove top. Our stay also included continental breakfast each morning at the reception area downstairs. Great for budget and fuss free travelling. The other time when I went, I took my parents for a trip to see the Sakura in Tokyo. This time I decided to stay at another hotel chain. This one is called Hotel Villa Fontaine. They also have 15 hotels around Tokyo. 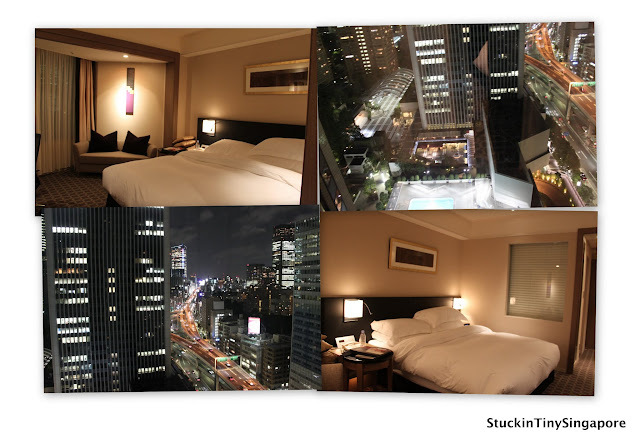 The one we stayed at was Shinjuku. Compared to Tokyu Stay hotel, this one was more difficult to locate, but once you are familiar with the location, it is convenient for Shinjuku. The hotel provides a breakfast and also free internet access (Lan/optical fibre not wireless). The rooms here range from JPY10000 to 18000 (SGD$150 - 280). I had a single room while my parents had a bigger double room. 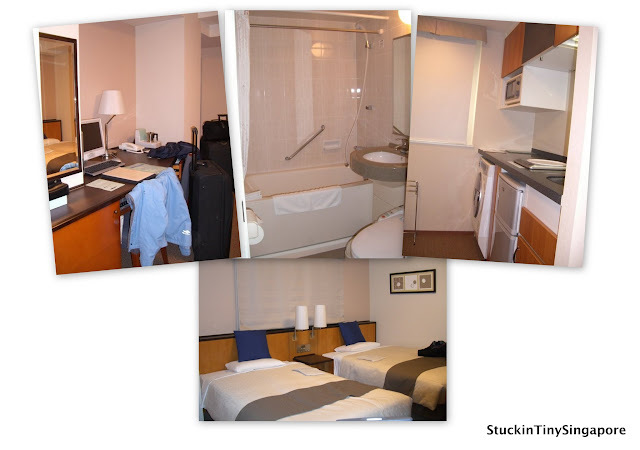 The decor was very nice and contemporary and we were all comfortable and happy during our 4 nights stay there. As mentioned previously, the husband travels quite a bit to Tokyo for business, and on occasions I went along for the free accommodation which was great. So for those trips, no more being stuck in a small room as most hotels in Tokyo are. The rooms at ANA Intercontinental was much larger. It was also very convenient as the Airport Limousine Bus from both Haneda and Narita stops at the hotel. ANA Intercontinental is also located between 2 metro stops - Ropponggi-Itchome Station on the Namboku line or Tameike-Sanno Station on the Namboku and Ginza line. The husband is usually upgraded to an executive deluxe room when staying as he is usually there for up to 9 nights in a row. In the executive room, you get free internet, a larger work desk and the rooms are on the higher floors. Rates for a standard room starts from around JPY25000 (SGD$390) per night. If I had to pay for my own stay, I will rather just go for a simple yet functional room at one of the many apartment hotel scattered around Tokyo. There are also several other hotel chains in addition to the two I mentioned here. These are: Sunroute hotel chain, Tokyo Inn, Toyoko Inn, Prince Hotels and the B-hotels, to name a few. Some of these hotels are not linked to any hotel search/booking sites, so do check their website individually to see if you can get a good deal directly. Tokyo itself is very spread out, even though public transport there is superb, it may be rather daunting to choose exactly which area you want to stay during your trip there. Here is a breakdown of the various areas in Tokyo. Hopefully it will be helpful to you in choosing which area to stay in. UENO - is a popular among budget travellers mainly due to its large range of budget hotels and hostels. It is also super convenient as the Narita train goes direct to Ueno station. It is also a major hub for other trains and metros to other parts of Tokyo. There is access to Ueno park and Ameyoko Market where it is a buzzling strip of street selling everything from fruits, to ramen to discounted sport shoes! ASAKUSA - is a great area to provide insight to the traditional side of Tokyo. You will find Edo period houses, temples and shrines. Some hostels are located in this area. There is no lack of restaurants in the area. NIHONBASHI - is in central Tokyo not far from Ginza and Tokyo station areas. It is mainly an office area, thus you can find many cheap business hotels. GINZA - is the expensive shopping district in Tokyo. You can still find reasonable accommodation if you go towards Tsukiji area like the Tokyu Stay I stayed in. Super convenient for most sights in Tokyo and you can find very good restaurants in the surrounding area, and Kabuki Theatre is a stone's throw away. It is also close to Tokyo station if you need to go elsewhere in Tokyo or Japan. TOKYO STATION - is convenient if you need to catch the train or Shinkansen to other parts of Japan. You have the Imperial Place and Marunouchi close by, but finding cheaper accommodation will be more difficult. SHINJUKU - a vibrant area for nightlife, shopping and everything neon Tokyo is famous for. The area has loads of accommodation on offer. The trade off for all these buzz and convenience is noise. Shinjuku station is the world's busiest station, which means it is super convenient to get to anyway in Tokyo or Japan. The romance train to Hakone also departs from here. Also beware that some of the budget hotels are situated in the red-light district of Tokyo, Kabuki-cho. I have walked through the area even at night and I didn't realise that it was a red-light district till the next day. So I guess the final decision is up to you. SHIBUYA - is another crowded and exciting area to stay in. Like Shinjuku, it has nightlife, shopping, restaurants and neon lights. It is also close by to upmarket and fashionable areas like Omotesando (reminds me of Fifth Avenue), Aoyama and Harajuku, the youth fashion mecca is also walking distance away. Compared to Shinjuku, I feel that there are less accommodation to choose from in Shibuya which seems pricier than Shinjuku. ROPPONGI - is know as the area with lots of bars and nightclubs at night. By day, it has some upmarket shopping and dining areas like Roppongi Hills and Mori Towers. It is a great area to explore too, as it is close to Akasaka, Hiro and Azabu, all areas popular with the expats in Tokyo. With that, it also means that accommodation in these areas are more expensive. IKEBUKURO - this is a busy, big travel hub in Northern Tokyo. It is not far from Shinjuku and provides convenient transfer to other parts of Tokyo and Saitama. There are several big shopping malls like Sunshine city in the vicinity. Lots of shopping and good priced restaurants in the area too. Being further north, the accommodation pricing here is reasonable. SHINAGAWA - A busy, convenient business area with large hotels like the Shinagawa Prince which contains everything from karaoke to bowling to an aquarium. It is also a big travel hub for Shinkansen trains too. Super convenient for getting to Yokohama and also for the monorail to Haneda Airport. This is just a short introduction to some of the main areas in Tokyo. Hope the post is useful for your initial planning for a trip to Tokyo. Next time I will write about the food in Tokyo....one of my favourite place to go for food - where you can have a michelin star meal for a very reasonable price!! Okay, my tummy is calling - time to go. Ciao for now. Till the next time. Stay happy and hope you are enjoying the blog. I just got back from Tokyo. It was awesome! I stayed with a friend, but my first bit of advice for anyone going there is to get ready for how expensive it is! Glad you enjoyed Tokyo. Yes indeed it can be expensive. I try to save on food there. I always try to stay at a place that provides breakfast.